Learn to create an APA Bibliography. Every research paper must provide a list of sources that were used throughout the document. The APA (American Psychological Association) style also requires a list of sources to be provided. Instead of an APA bibliography there is an APA reference page. These two lists of sources serve the same need; however, the terms used to refer to these lists are entirely different. It is the Chicago Manual style that requires a bibliography. The APA style requires a reference list. When presenting scholarly written materials, social and behavioral scientists use the APA format. This writing style provides its writers with the necessary guidelines to present scientific research in a clear, concise manner. As a result, complex scientific ideas are understood by its audience. 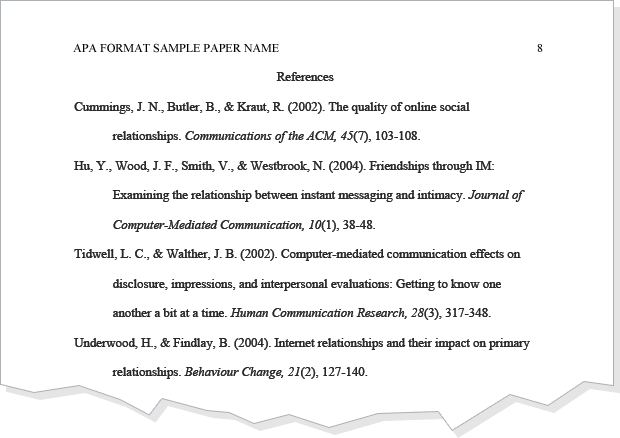 APA Bibliography example of an References page. As the term suggests, an in-text citation is a method used to refer to the works of others within the text of your work. The in-text APA citation consists of the author’s last name and year of publication for the referenced work. The APA reference list, or APA bibliography, is located at the end of the paper and contains the citation in greater detail. The reference list must include each in-text citation. The correct term for the APA bibliography is “References” page. Because the Chicago writing style is commonly used and refers to its list of sources as the bibliography, many people mistakenly refer to the APA reference list as the APA bibliography. Although both serve the same purpose, it is important for writers to know that the correct term for an APA list of resources is a references list. The reference list must begin on a separate page from the essay and coordinate with all in-text citations used throughout the text. This ensures that all APA citations are accounted for from its original source. Moreover, a writer provides credibility for the work and the audience knows where to look if they desire more information on the topic. The correct term for an APA bibliography is reference list. Always locate the “References” title at the top, center of the page. Indent the 2nd and subsequent lines of each references entry. Entries must be alphabetized by last name of the author.